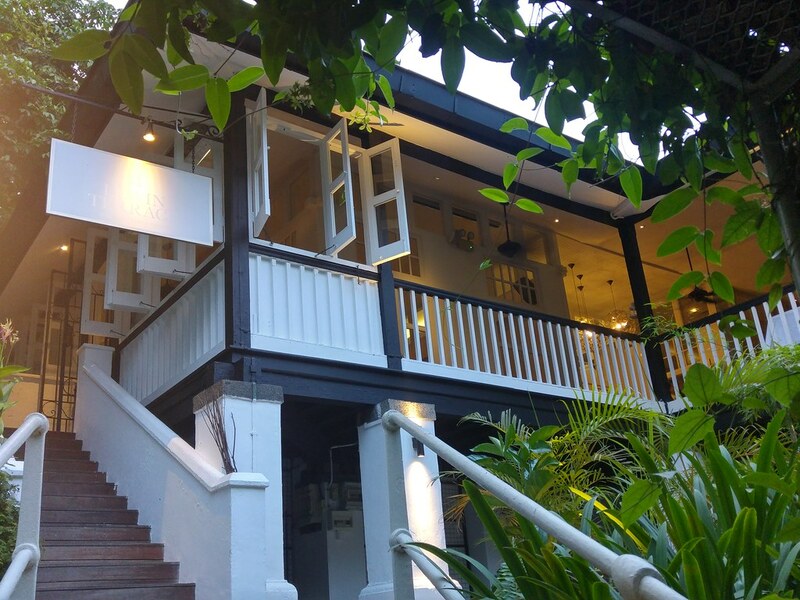 Lewin Terrace at Fort Canning is introducing their Autumn, seasonal Sho-Mi menu starting from the month of September to November. 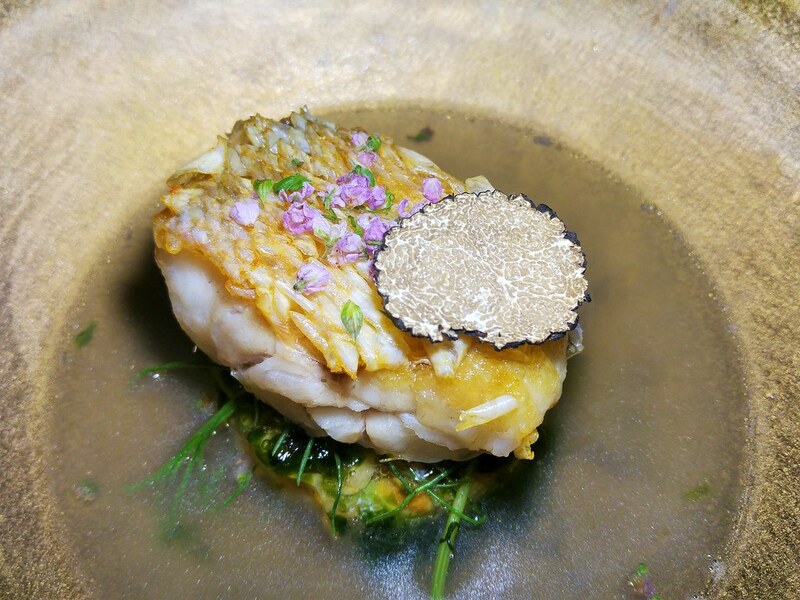 Executive Chef Keisuke Matsumoto will be featuring ingredients native to Japan during the Autumn season, in his exquisite Japanese-French fusion dishes. 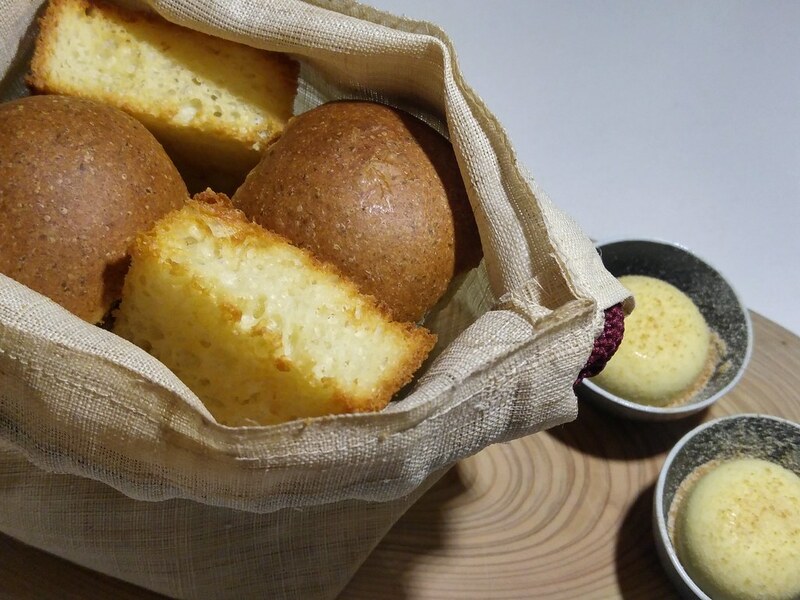 Freshly baked breads with rich creamy butter are invariably served in any French restaurants. Brought to us in a mini haversack, the buttery aroma of their homemade breads was mouthwatering. With the bottom filled with warmed pepples, the mini haversack was a live oven, toasting the breads for a good one hour. 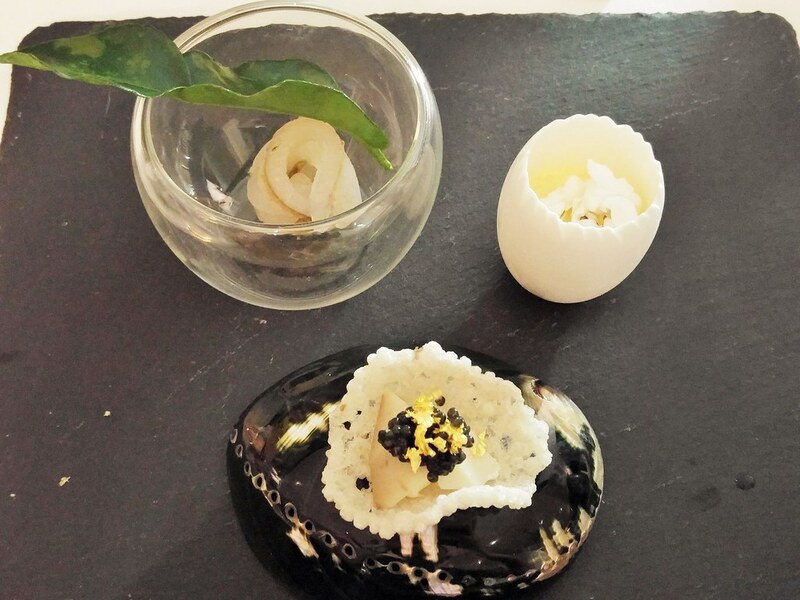 Our Amuse Bouche showcases Chef Keisuke's delicate mind. Despite their tiny frames, they seems to have the ability to trickle each of my taste buds, especially the Hokkaido scallop crowned with caviar and bound to a crunchy tapioca chip using mascarpone cheese. The chemistry between the ingredients was unexpected. The sweet corn mousse in egg shell is really cute, with crunchy popcorns for textural contrast. The highlight of this dish is the creamy Spanish Red Urchin that spread across the tofu. Judging from its tanner body, it does have a deeper oceany taste than usual, hence supporting it with tofu is just apt. Smoked in situ, the mild tasting homemade tofu acquired a smokey flavour which was accentuated by savoury aged miso. The fried green beans was slightly chewy, that adds an interesting bite to the crunch. Traditionally, Blancmange is a sweet dessert, commonly made with milk or cream and sugar thickened with gelatine. 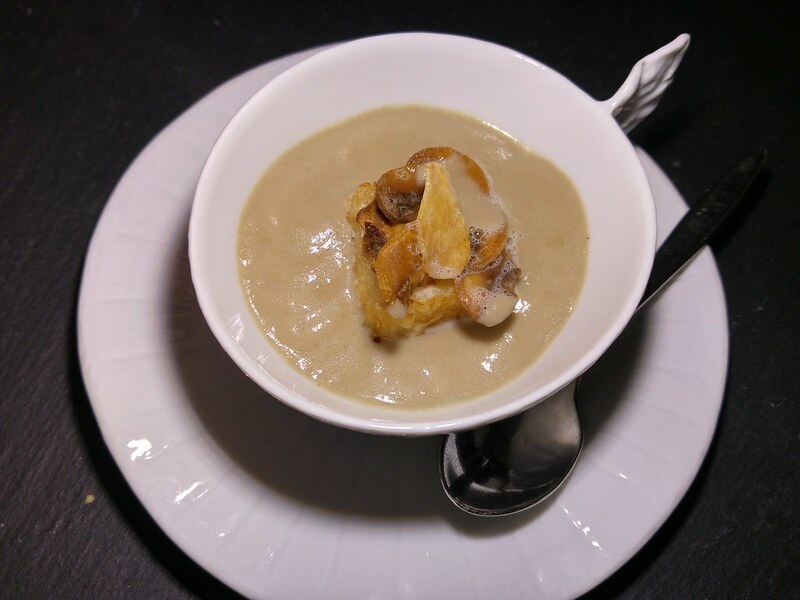 However, over here, we had it paired with savoury mushroom base. Somehow I relate it to a thick mushroom soup. Instead of having the usual croutons, I have a chewy Prosciotto Blancmange. I appreciate the potency of the mushroom base but overall it was a little cloying for me. 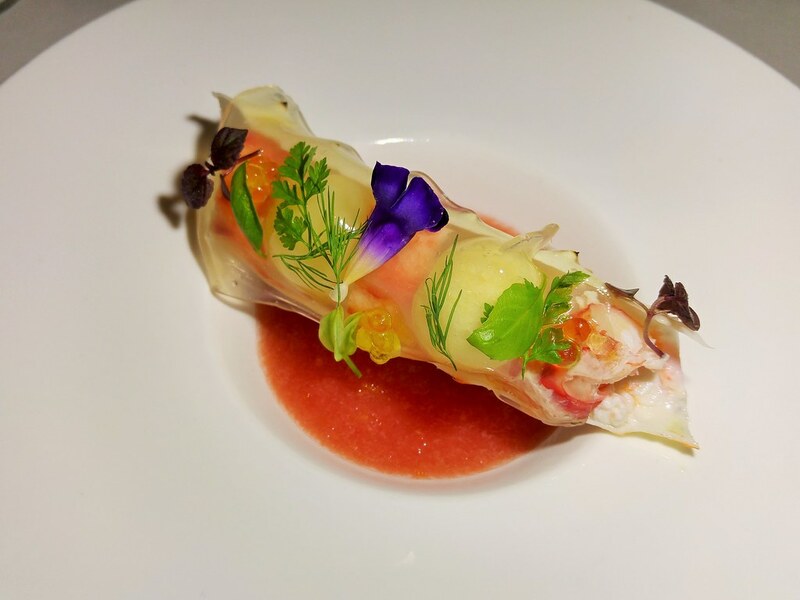 Perhaps the richness of the previous dish is to prepare our tastebuds for the Hokkaido Crab, with texture and flavours of the other end of the spectrum. 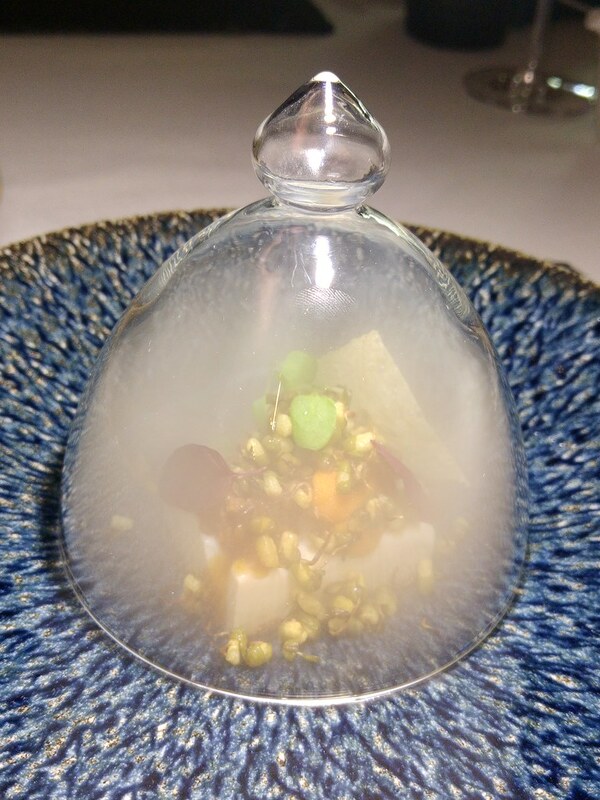 We were served a plate sprayed with sherry liqueur, invigorating our senses before tasting the next dish. Along with sweet, crunchy Japanese apple and celery root cubes, the delicate beautifully encased within its shell and a layer of sweet, tangy yuzu jelly. You may choose to eat it as it is or plate it onto the dish given. The tomato gazpacho was tangy with a spicy edge. It was like a virgin mary mocktail that fire up the overall taste. My favourite dish for the night is the Amadai. What makes this dish so delightful is not simply because of the premium fish used but the risotto at the bottom. Made using Koshihikari, which to some is the crown jewel of Japanese short-grain rice. It is noted for its sweet nuttiness. Being slightly sticky, it gives the risotto the desired texture. Served like Japanese tea rice, I was curious as I would imagine the risotto losing that wonderful stickiness and flavour. That, surprisingly, was taken care of. The rice had been prebaked. Just imagine eating the burnt rice at the bottom of the claypot but with the accompany of a broth that was enriched with the goodness of the buttery Amadai. 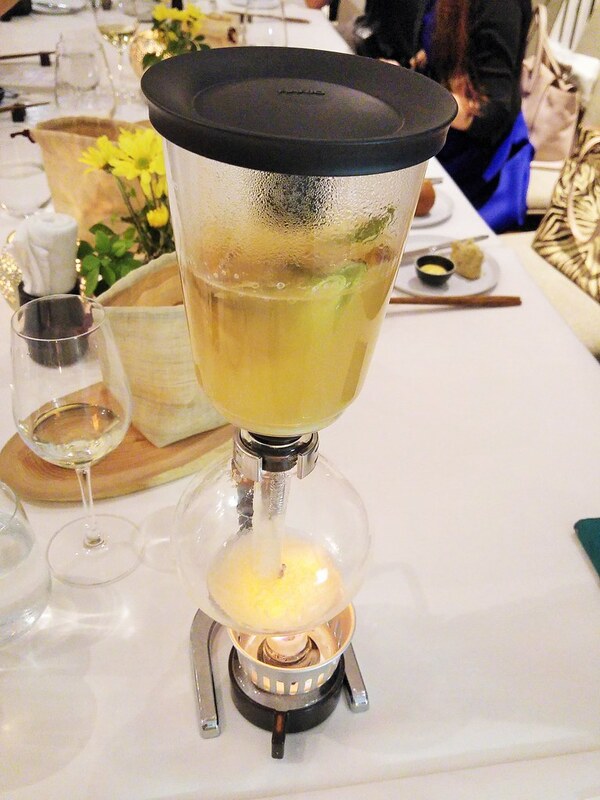 Another interesting element is that the broth was prepared in a syphon manner to achieve the desired flavour. Japanese Wagyu Steak is one of their signatures here. Rossini Style, as I read was invented by the great French chef Auguste Escoffier for the Italian composer, Gioachino Rossini in the 1800s. 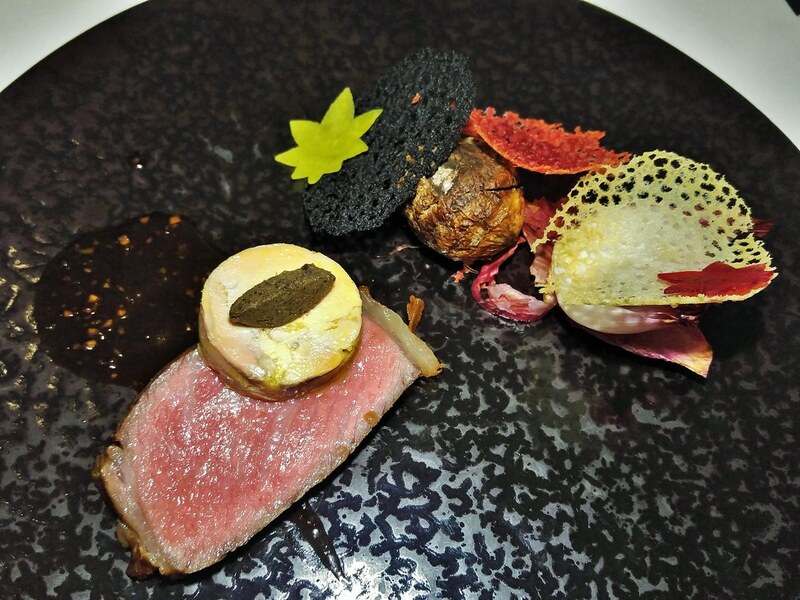 It is characterised by the decadent foie gras terrine and Japanese mushroom paste truffle atop. Putting the extravagance aside, what I appreciate is the Nippon aspect, using autumn ingredients - yellow & red beets, roasted yam and onions. 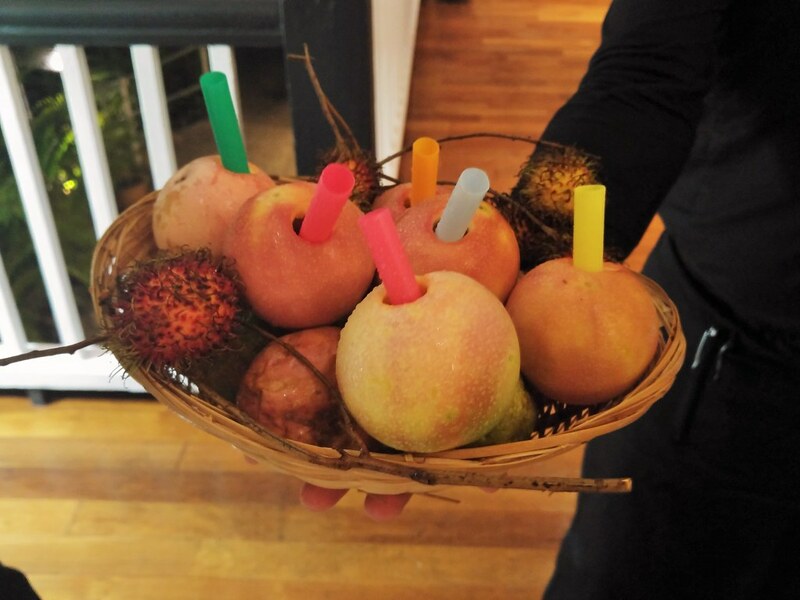 To clear our palate for dessert, we had a refreshing Passion Fruit Slurpee made with mikan juice and lychee jelly. I love the eco friendliness of drinking directly from the passion fruit itself. 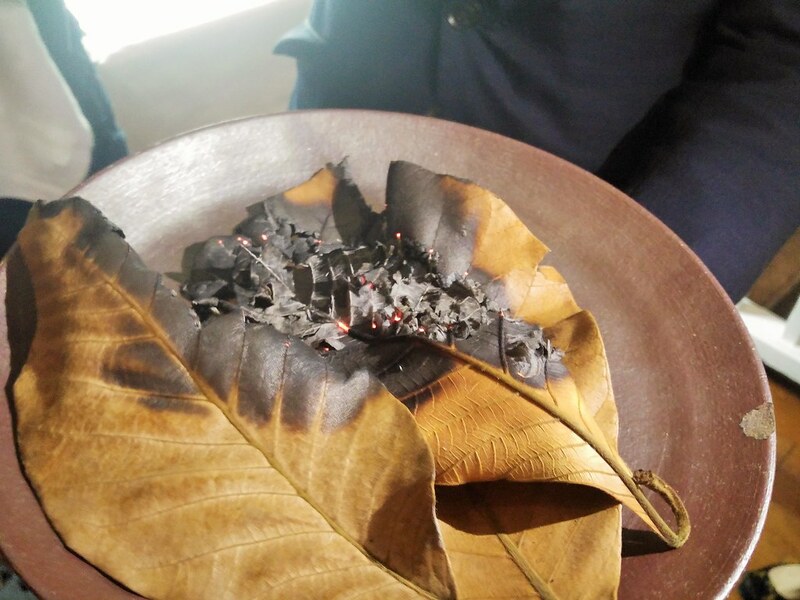 Before our dessert, a basin of burnt old leaves was presented to us to showcase the significance of our dessert, roasting sweet potato over old dried leaves collected around their living spaces. 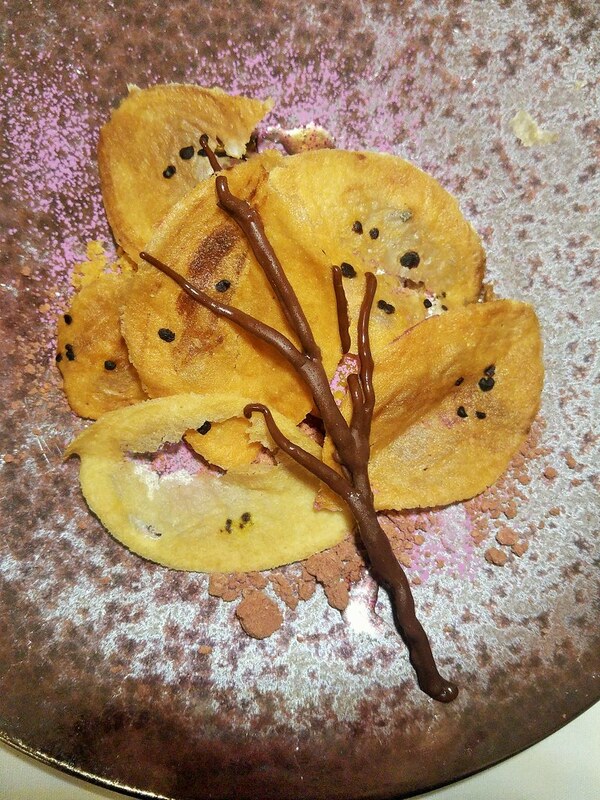 Underneath the stalk, crafted using fried sweet potato chips and chocolate, was perhaps how it feels like being in Japan during autumn. The cold salted caramel ice cream was like a cool breeze against the warm, sweet and comforting sweet potato mash, made simply with just egg and cream. 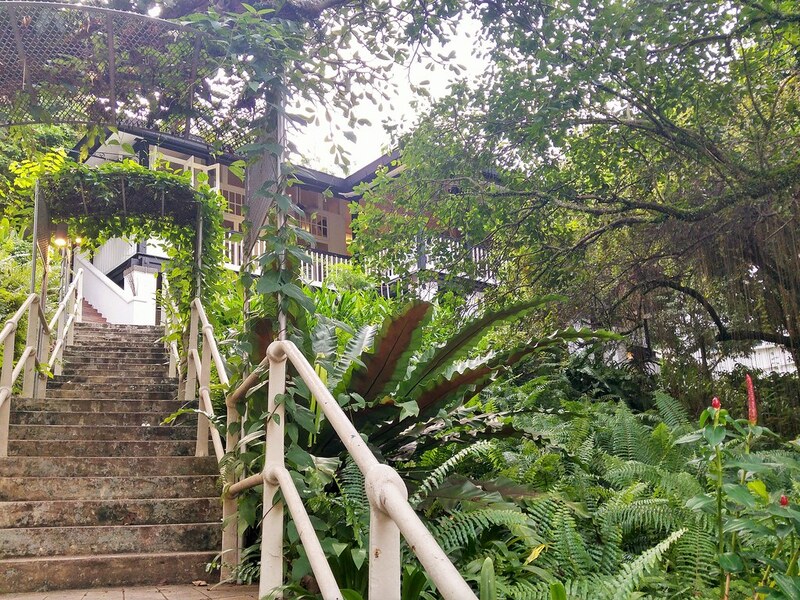 It's interesting to see how Chef can overturn a ordinary root into something so captivating. Opening the box of Small World is like unveiling a box of chocolate - you never know what you are gonna get. 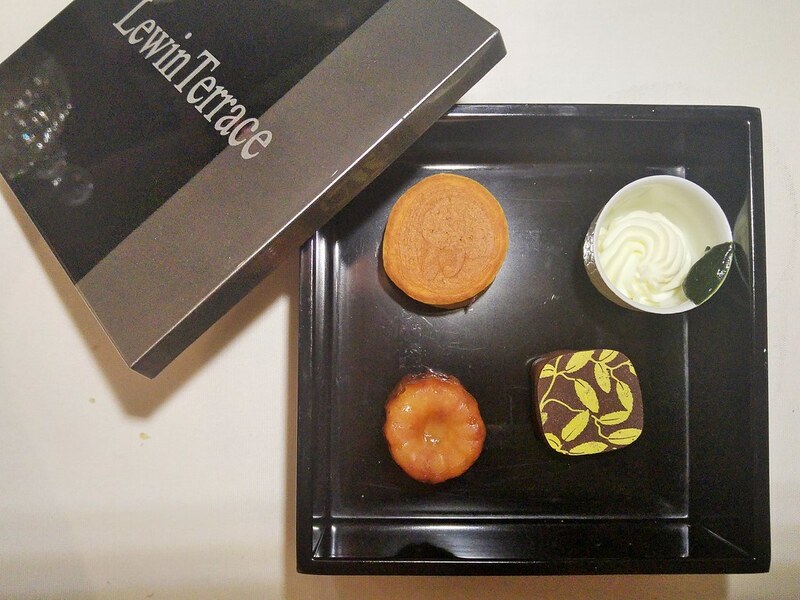 What steals our heart was the honeyed chewy Canelé and the bitter-sweet green tea mousse. 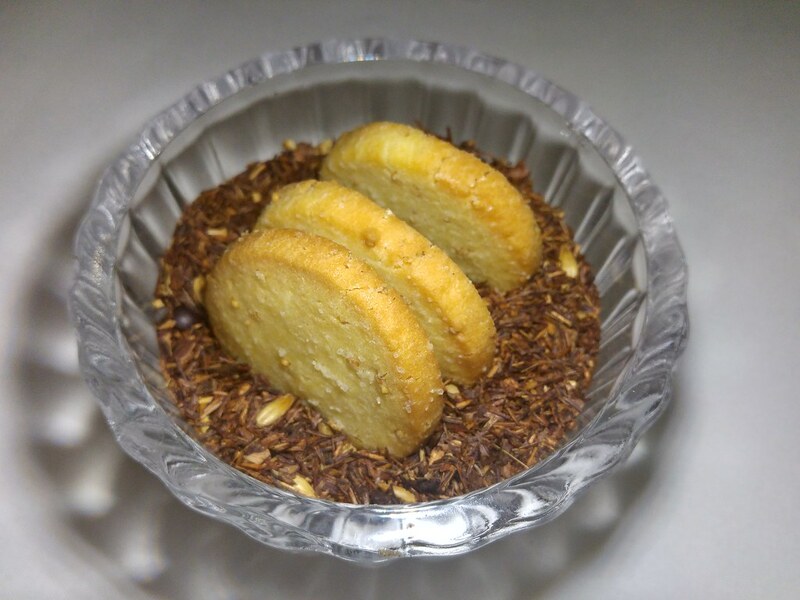 Among all the stunning dishes, do not miss out this bowl of unassuming looking cookies. Bring the bowl near you, and allow your mind to be sooth by the fresh, orangy fragrances of the tea leaves, comprising rooibos and oolong. Not only you get to smell it, you get to eat it as all these wonderful fragrances has infused into the buttery cookies. I enjoy all the small details that was being incorporated throughout the evening. From presenting the sweet corn eggs in an enclosed wooden box before unravelling them, like discovering a golden goose egg, to burning of old leaves, which instantly instilled in my mind a image of them roasting sweet potatoes over them back in their homes in Japan, I don't just get to taste the autumn dishes, I almost get to feel what it is really like to be in Japan at this time of the year. This Wakon-Yousai menu is $118, with Wine Pairing $120(6 Glass). Written and photograph by Si An. A girl who is allured by travelling, loves the feel of freedom, smell of the rain and the aroma of fine coffee and food. Note: This is an invited tasting.